Kunmadaras in Hungary was one of the largest Soviet fighter bases outside the Soviet Union. 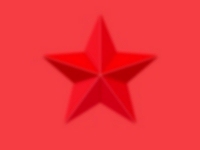 It housed two complete regiments (wings): a reconnaissance regiment with Su 17M-4, Su 17UM-3 and Su 24MR, and a fighter-bomber regiment with MiG 27 and MiG 23. After the wall came down in 1989, the Soviets left the base in April 1991. Very little is known about what went on at this air base. The base is no longer used as a military installation, and parts of it are now in use for the storage of agricultural supplies and equipment. The runway is used by agricultural planes. Karoly Vandor used to live near this mighty former base, and he has developped a deep interest in it. He even decided to dedicate a museum to it, that is under development. It is now located in a house in Nagyiván (14 kilometers from Kunmadaras), but it will soon move to the former base, to be located in the former regiment-museum. Part of his knowledge about Kunmadaras is shown on this page, as an introduction to his museum. 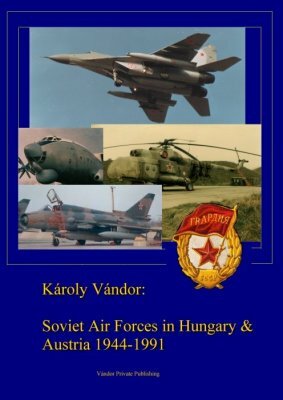 Karoly recently finished work on a book about all Soviet bases in Hungary. It will be available from June or July 2003. The book is A4 size, 152 pages, in English and Hungarian langauge, with more than 250 black and white photos, and a color soft cover. Price is 20 Euros. Also available are a CD with 400 color and b&w photos, and 3 videos, featuring Su 24MR, MiG 29 (9-13), Su 17M4R, MiG 27M/D, MiG 23M/UB, An 26 and MiG 29UB. Price of each is 10 Euros. If the CD is ordered together with the book, the price is 25 Euros. The book can be ordered via e-mail and mail (Vandor Karoly, Szentendre, Pannonia u. 3., 2000, Hungary). If you can help, please contact Karoly (Charlie) Vandor. If you want to visit his museum, write him to make an appointment. Additionally there were some Mi 8's for SAR duties and some Mi 6K's. Most likely these helicopters were detachments of the 396. Helicopter Regiment from Kalocsa. An-22's and Il-76/78's visited regularly to bring supplies, and the Su 24MR's practised air refuelling with the Il 78's. The base had 69 shelters, a number not matched by any base I know. Three types of shelters are present: 31 Type 1/10 (first generation, 10 meters diameter), 24 Type 2A/13 (13 meters diameter) and 14 Type 3/16 (modern, large 16 meters diameter). Three shelters were not used for aircraft storage but were used for ECM duties. Karloy notes that the 1. 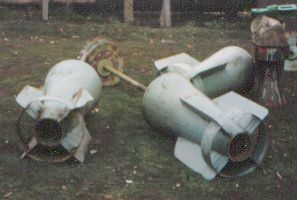 Fighter-Bomber Regiment had nuclear weapons to its disposal, with a special storage facility. Conveniently located some 12 to 14 kilometers away was a bombing range near Nagyivan, called 'Bombodrom Nagyivan' or 'Poligon Nagyivan' in Russian. AgitAB-500 tails found in Nagyivan. The 328. Independent Guard Reconnaissance Regiment left Kunmadaras on 14 and 15 April 1991 and relocated to Odessa; the 1. Fighter-Bomber Regiment left on 17 and 18 April 1991. After the "local" regiments had left, the helicopter regiment of Tököl landed at Kunmadaras to be fuelled for the long trip home! 1974: the pilots within the 1. Fighter-Bomber Regiment had a great quarrel, which led to a split-up and the formation of a new unit, the 328. Independent Reconnaissance Regiment. Shortly afterwards the 1. 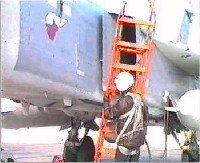 Regiment received early models of the MiG 23, and the 328. Regiment got 22 Su 17M's and 14 Yak 28R's. The Fitters were later replaced by later models, first the Su 17M-2 and finally the Su 17M-4. 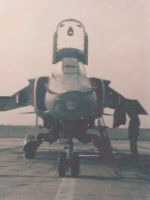 1985-1987: the base was renewed, and the aircraft were located at Mezõkövesd (a reserve base). 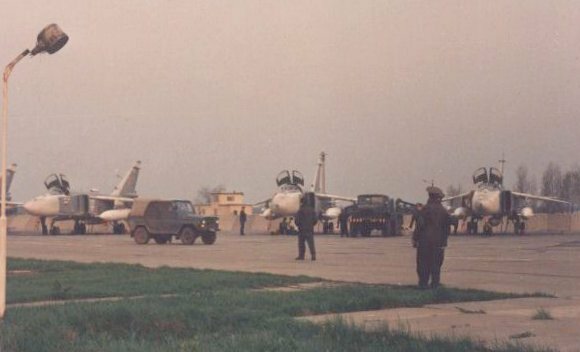 Upon the return to Kunmadaras, the old Yak 28R's were put in storage and replaced by the new and advanced Su 24MR, that arrived during the night because they were so secret. The secret wasn't kept very long though, since the West German Air Consul in Hungary revealed in 1989 that Kunmadaras housed 13 Su 24's.